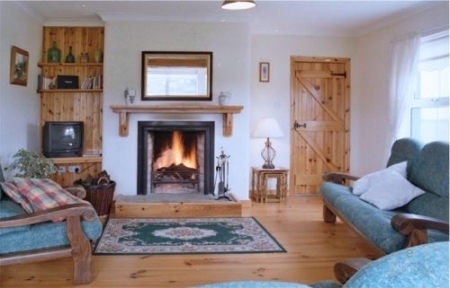 Decorated and furnished to a very high standard, this family friendly Irish Self Catering Holiday Cottage with SAUNA is warm, cosy, comfortable, safe, secure and spacious. Ground floor open plan living room. Adjoining fully fitted kitchen and dining area. Kitchen with dishwasher, fridge freezer, electric cooker, microwave, and practically every household necessity. Utility room with washing machine, tumble dryer, iron and ironing board. Upstairs two large ensuite bedrooms. 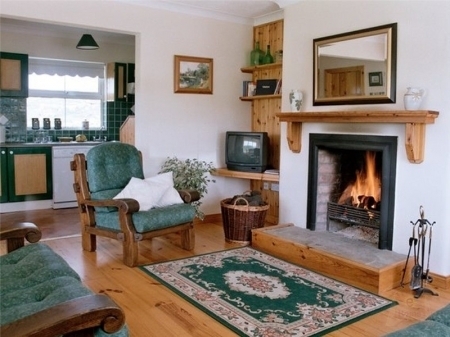 Turf for the open fire is supplied within the cottage rental. Oil and electricity are metered and charged as per usage. A deposit of 25% low season / 200 Euro per week high season is required to confirm reservation. All deposits will be acknowledged. The full balance is payable on day of arrival. Rental period is from 4 p.m. on the afternoon of arrival until 10 a.m. on the morning of departure. All our houses sleep 7, only this number is allowed. 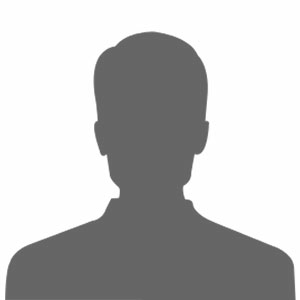 Bed linen is provided free of charge, except for short-term lettings then a charge will apply. Visitors are requested to bring their own towels. O.F.C.H and electricity are charged extra, as per usage. Hirer is responsible for any breakages or damage caused to contents.